More than often when thinking about credit and debit cards, the first thing we wonder about is which one of the two is the better choice. To establish this, you first need to understand what each is. Credit cards are standard and only extend a line of credit to its user. Debit cards do not offer this and only transfer money available in its user’s bank account when making purchases. Below, a few more comparisons are listed and explained to establish which one of the two will suit you best! Here in this article, we will have a look at credit card vs. debit card. Applying for a credit card can be somewhat challenging, and longer process since acceptance depends on your credit history while an applying for a debit card is much easier as there is no barrier. Monthly bills can be associated with credit cards, but not with debit cards. 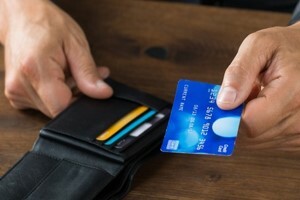 A credit card will not require a connection to a checking account while a debit card needs to be connected to an active checking or savings account. The spending limit of a credit card depends on the credit limit set by the issuer. These limits can increase over time. A debit cards limit is dependent on the amount of money available in the account. Interest applies to credit cards, but most issuers have grace periods available where they charge no interest. Debit cards have no interest rates since no money is borrowed. If used responsibly, usage of a credit card can improve your credit rating and this can be to your advantage when applying to purchase a house or car. A debit card has no effect on your credit rating at all. Overdraw fees on a credit card are very low and very high on debit cards. Rewards offered with credit cards are mostly much more profitable than those on debit cards. Rewards associated with debit cards also take much longer to earn than with credit cards. Credit cards rarely have a pin associated with them when swiping the card at a retailer; however, online purchases will require one. In most cases, you require no signature either. Debit cards always make use of a pin code and signature. Chances are low for fraudulent activity on a credit card. Fraudulent activities are more common with debit cards, and the process of investigating this can take very long. Each card has their set of advantages and disadvantages and choosing the best one for you will ultimately depend on what you want to achieve by having the card. You need to take all the factors into consideration before choosing to have one and not the other. Alternatively, you can choose to have both types of cards.